Black and sheer, the Cliffs of Moher are formidable. 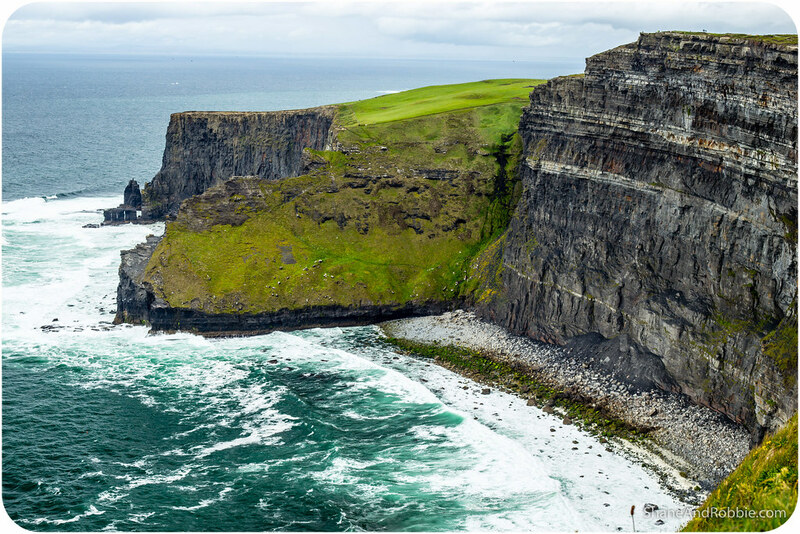 Instantly recognisable, these 200m high precipices are iconically Irish and every year a million tourists visit the wind-swept western coast of this island to admire their rugged beauty. 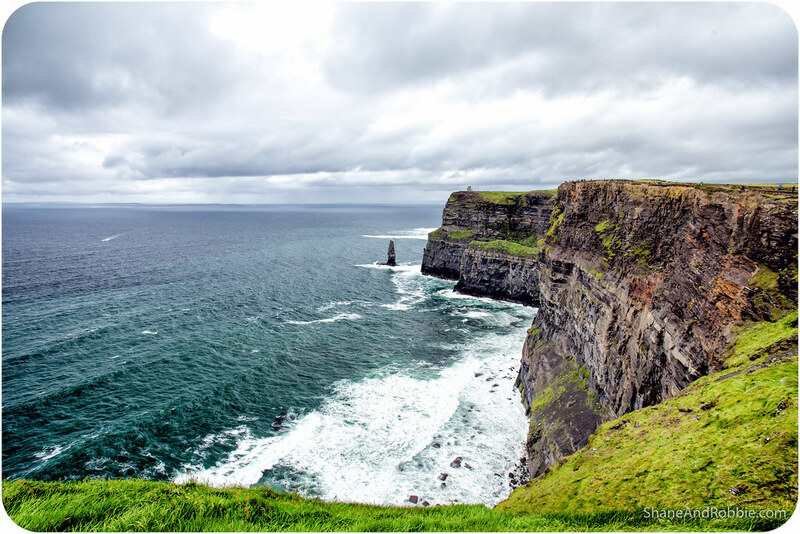 The cliffs are not far from Galway City and so today we joined the legions of visitors who have stood at the edge of Ireland and admired the spectacular Cliffe of Moher. 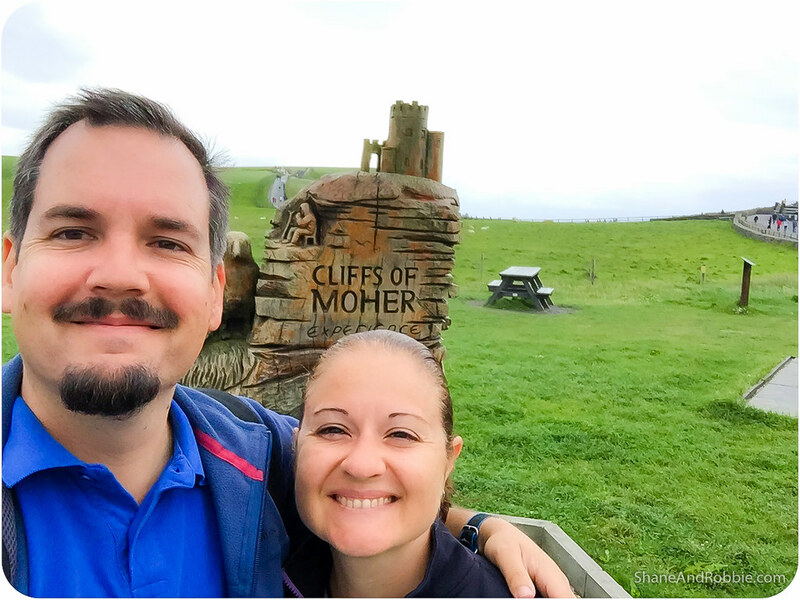 To reach the Cliffs of Moher from Galway City we first had to traverse The Burren, a seemingly barren region of limestone rock that seems to change colour depending on the weather and the mood of the day. 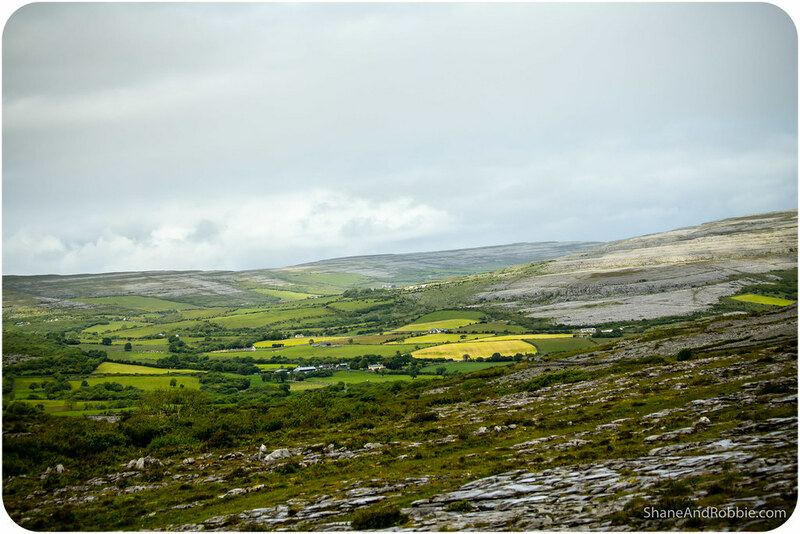 The name “Burren” comes from the Irish word “boíreann” meaning “a rocky place” – and apt name for this inhospitable expanse of mountainous terrain. 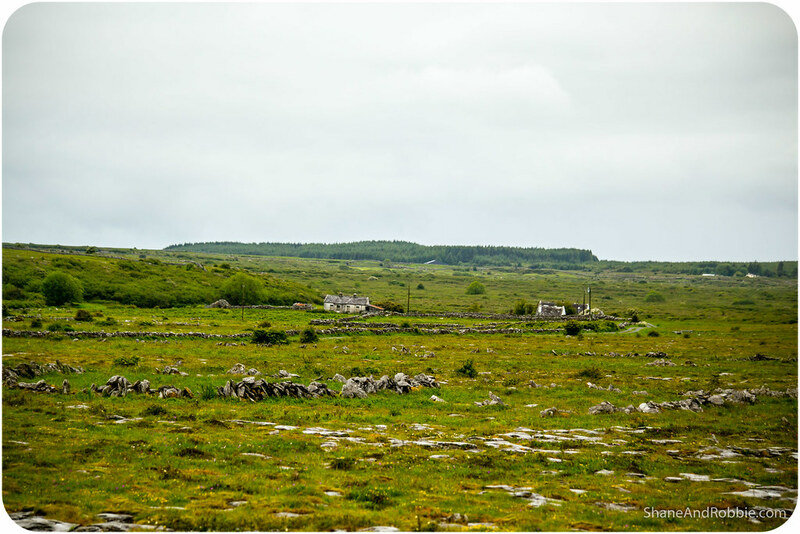 The rolling hills of Burren are composed of limestone pavements formed as sediments of an ancient ocean some 350 million years ago. Evidence of this are found in the fossilised corals, ammonites and other sea creatures littered all across The Burren. 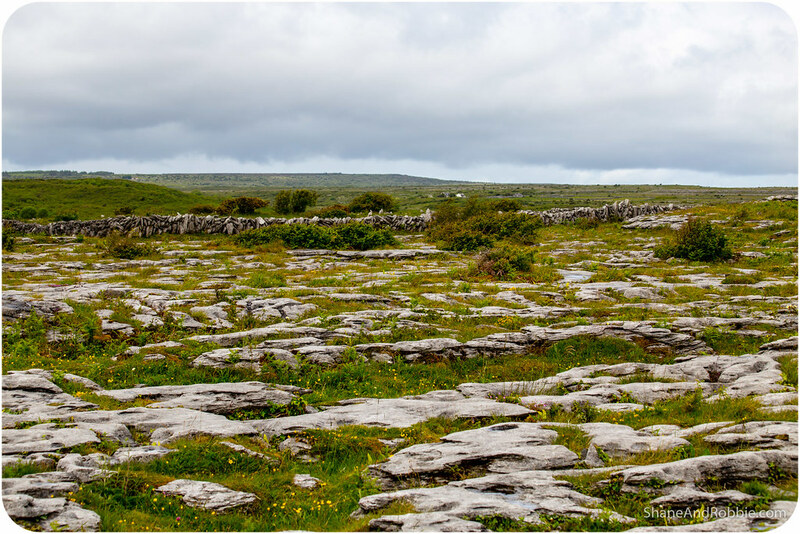 The Burren’s hills of limestone are criss-crossed with cracks and crevices known as grikes. The grikes formed over millennia as rain water wore away the rock. 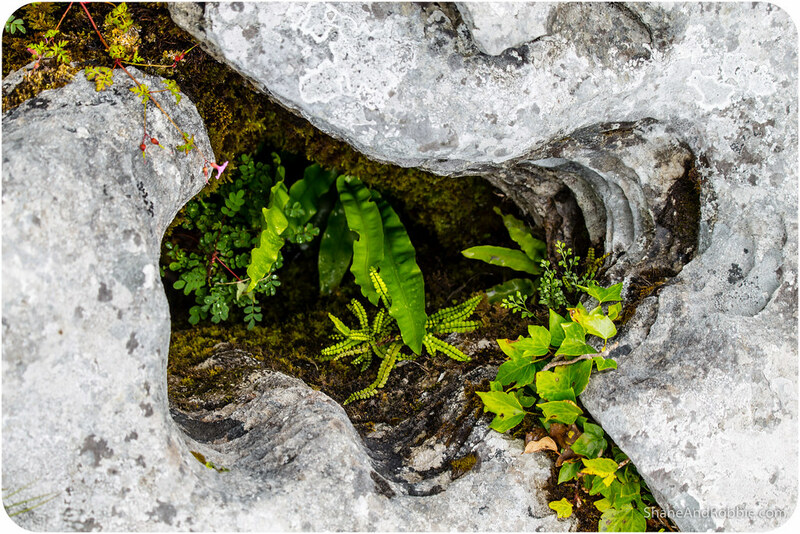 It is only up close, when you pear into these grikes, that the real wonder of The Burren reveals itself. Because it is inside the sheltered grikes that soil has collected and sheltered micro-climates have evolved, allowing tiny ecosystems to develop in each crack. There are Arctic, Mediterranean and alpine plants all growing side-by-side, in their separate little micro-environments. It’s a fascinating landscape with few inhabitants. The small number of farmers who DO live in The Burrens are descendants of the hardy folk who, over the centuries, have manually cleared sections of rocky ground and created pockets of arable land. 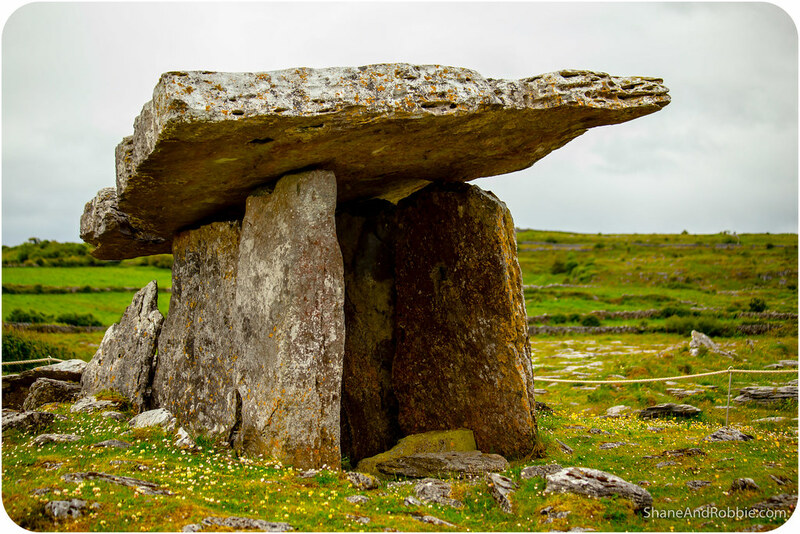 Adding to The Burren’s unique appeal are the various archaeological sites dotted around the area; including Neolithic tombs, Celtic ring forts, and early Christian religious sites. We stopped on our way to the Cliffs of Moher at Poulnabrone, an ancient tomb dating back thousands of years. 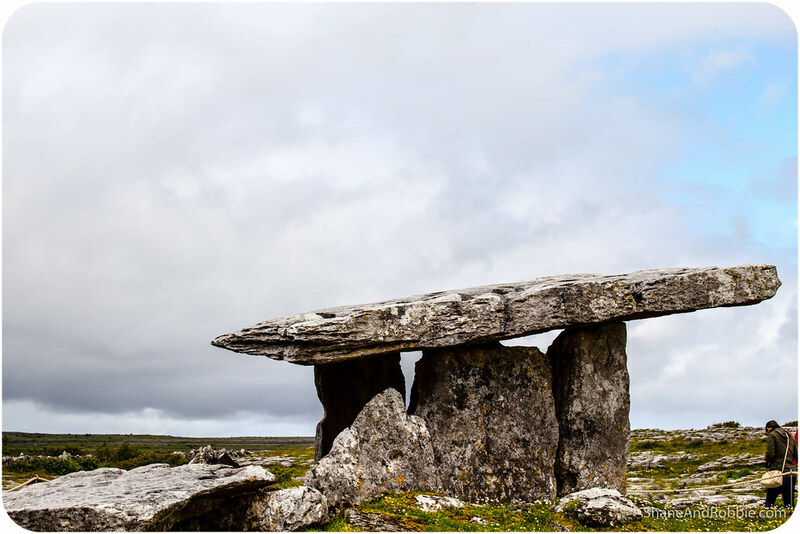 Standing proud in the stark landscape of The Burren, Poulnabrone is a communal tomb, once used by local tribes people. The remains of 22 people have been found within the tomb; all of them disarticulated and showing evidence of burning, indicating that perhaps the ancient tribes of Ireland used to burn their dead before burying the bones. 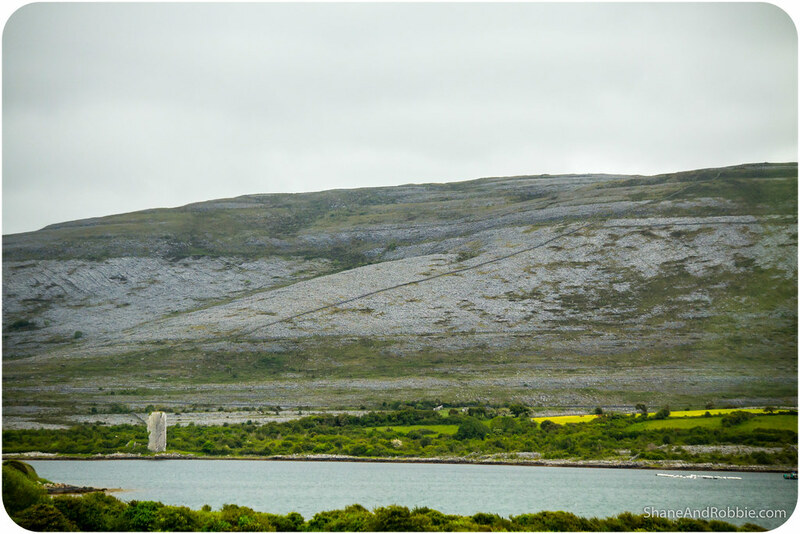 In places the hills of The Burren meet the Atlantic. Here the limestone rock is even more pitted and worn with crevices due to the effects of the wind and salt air of the ocean. As we drove along the coastal road, across towards the Cliffs of Moher, we saw a few fishermen standing on the slippery rocks. These dedicated anglers were throwing their lines far into the turbulent waters of the Atlantic Ocean, hoping no doubt for some mackerel or other cold water fish for dinner. After crossing The Burren we decided to stop in Doolin for lunch. This tiny coastal village straddles the River Aille, its harbour built where the river empties into the Atlantic. It’s from Doolin that the tourist boats and ferries bound for the Aran Islands depart. 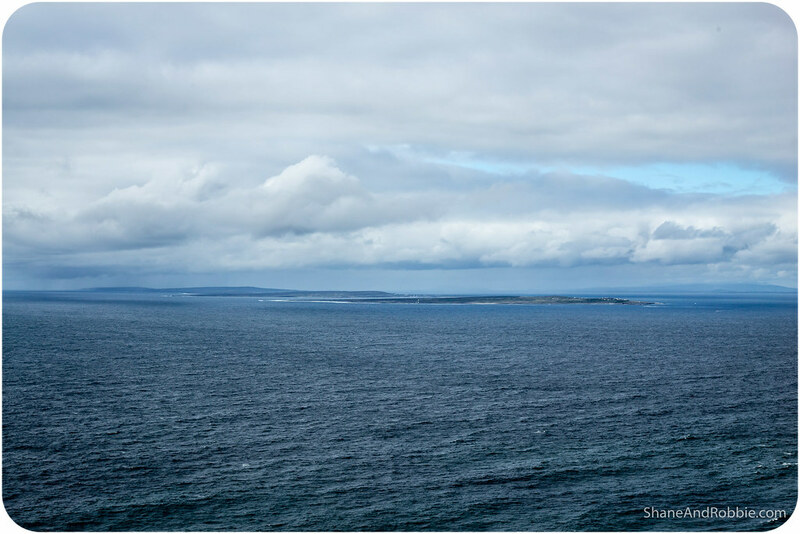 The isolated Aran Islands are wild and windswept, home to just a few hundred hardy souls, lots of seals and innumerable sea birds. They are supposed to be beautiful, but are not on our itinerary this time round (though we did get to see them, way off in the distance). Given the windy conditions and rough seas we gave the Aran Islands a miss today and instead opted for the warmth and comfort of O’Connor’s Pub. 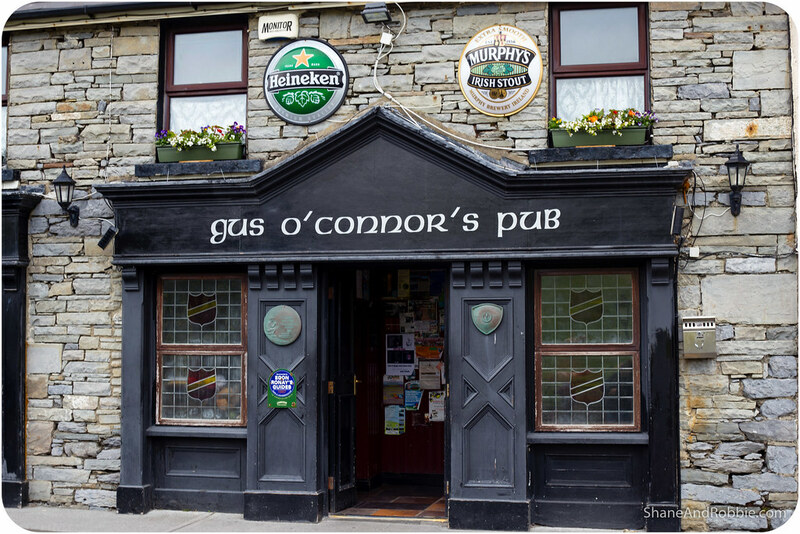 Built in 1832 O’Connor’s Pub is a local institution, famed for its food and the traditional Irish folk music it hosts nightly. Unfortunately there was no music playing whilst we were there, but the atmosphere was still convivial and vibrant – great for enjoying our hearty lunch of Irish stew (served with the obligatory dose of mashed potato and a generous slab of thickly buttered soda bread). Warm and replete after our substantial repast we contemplated forgetting the Cliffs of Moher and just spending our afternoon in the pub…. Eventually, though, we found the fortitude to brave the windy, rainy conditions and set off once again. 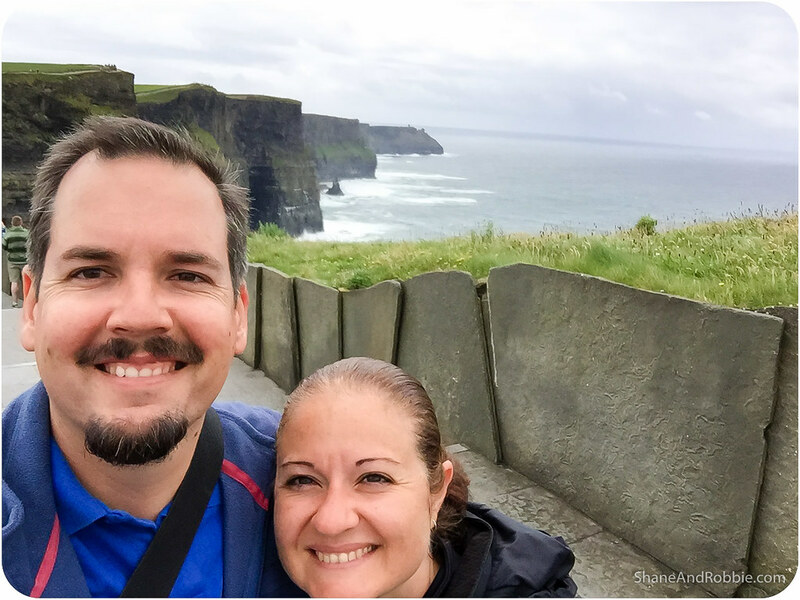 Our courage paid off because the cliffs were spectacular! 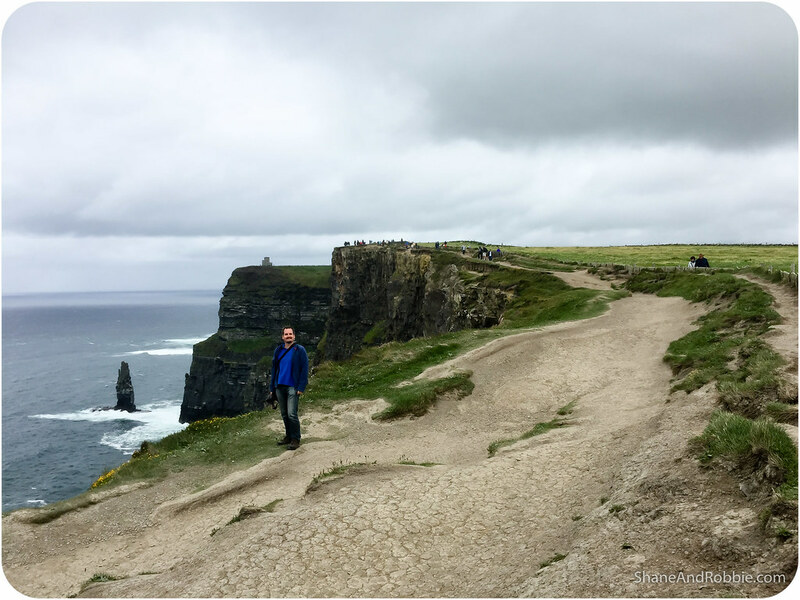 The Cliffs of Moher are every bit as incredible as you might expect. 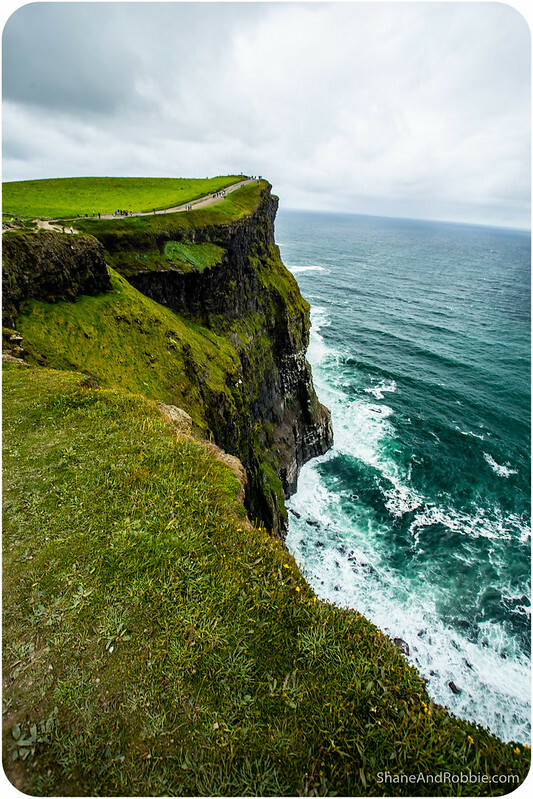 The black shale of the cliffs makes for a dramatic counter-point to the vivid green grass growing along the top of the cliffs and the deep blue ocean below. 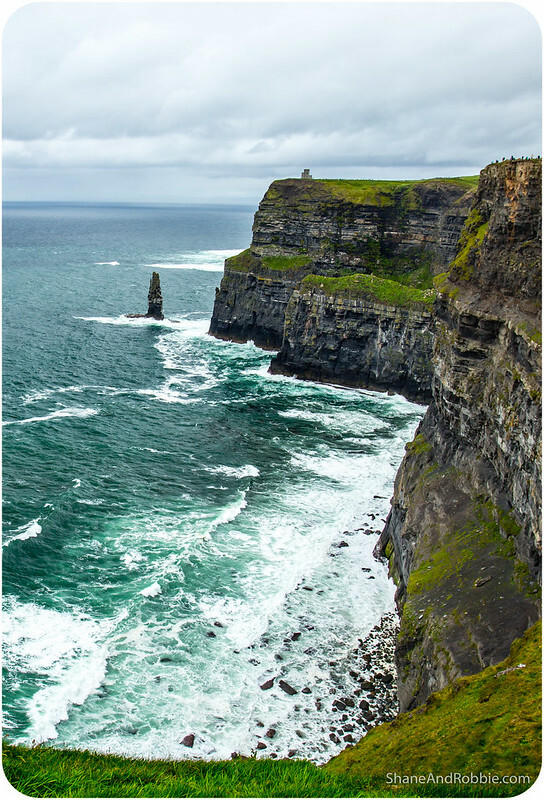 The cliffs take their name from an old fort called Moher that once stood on Hag’s Head, the southernmost point of the cliffs. 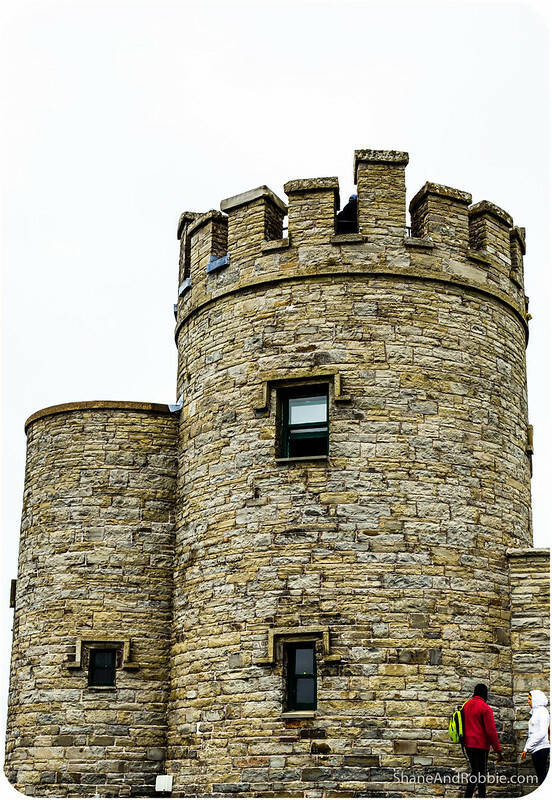 A round stone tower stands at the midpoint of the cliffs; built in 1835 by Sir Cornelius O’Brien, O’Brien’s Tower was once a lookout post. 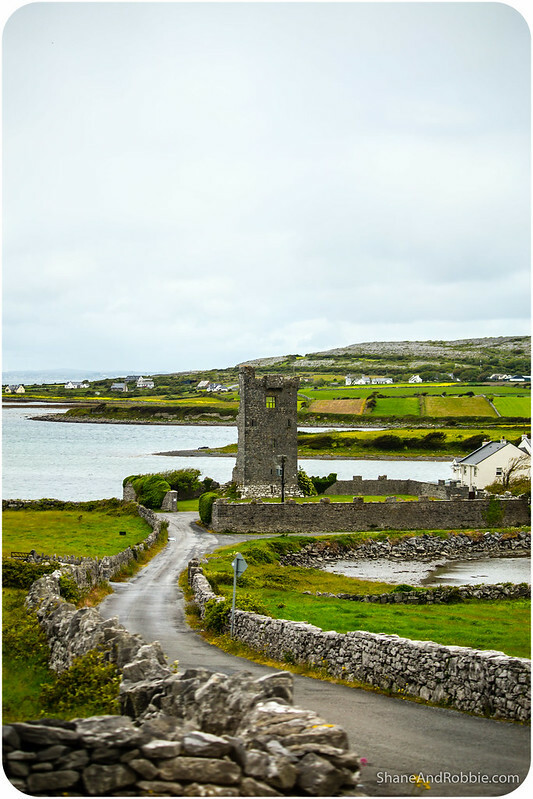 Today tourists pay to climb it for views across the cliffs and out to the Aran Islands. 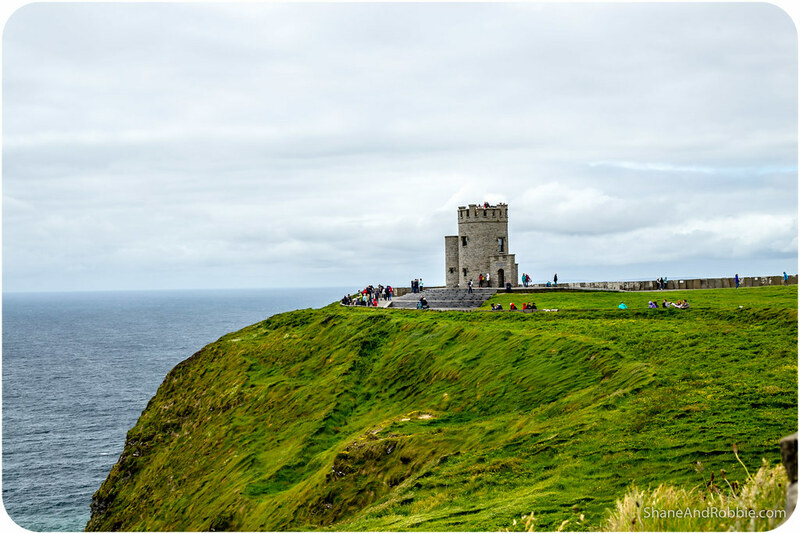 Being Ireland’s most visited tourist site, the cliffs were VERY busy. We quickly left the crowds behind though, simply by walking a little bit further along than most tourists are willing to do. 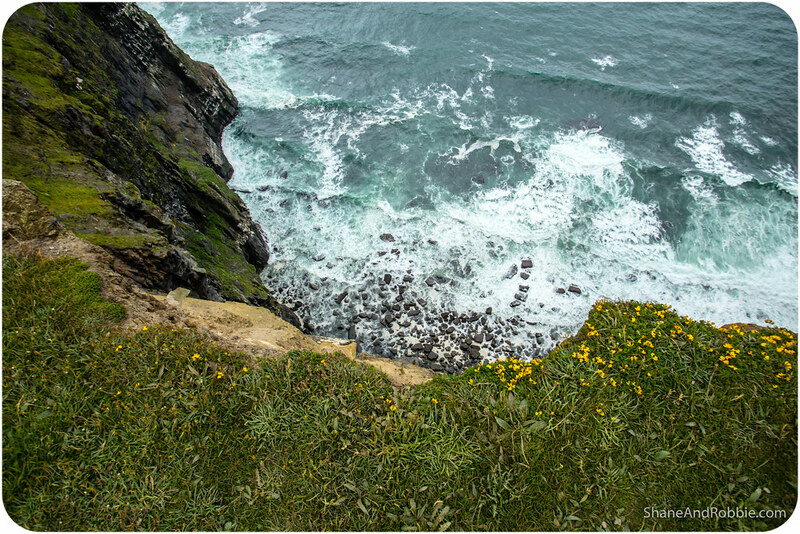 Shane was walking right out along the cliffs’ edge while I watched from a slightly less vertiginous vantage point a few metres back. 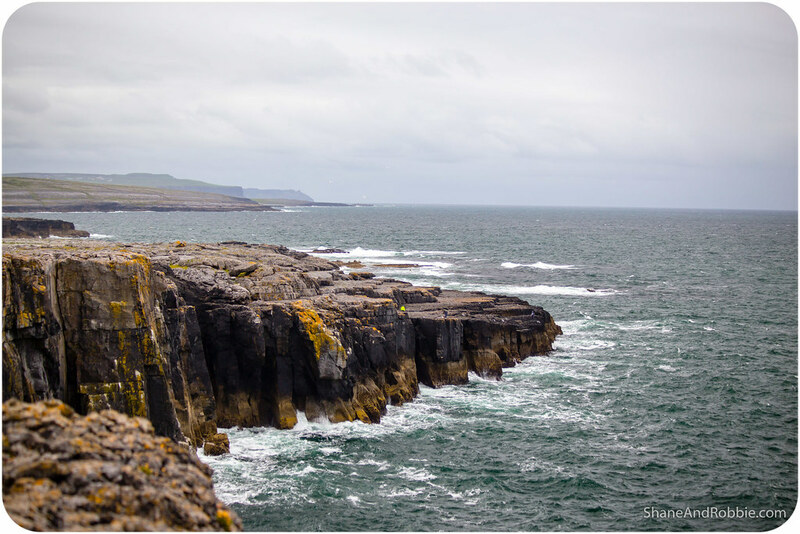 We walked all the way down to Hag’s Head and back to the main Visitor’s Centre, enjoying the calls of seabirds and epic views along the way. Having thoroughly enjoyed our visit to the Cliffs of Moher we started making our way back to Galway City around mid-afternoon. 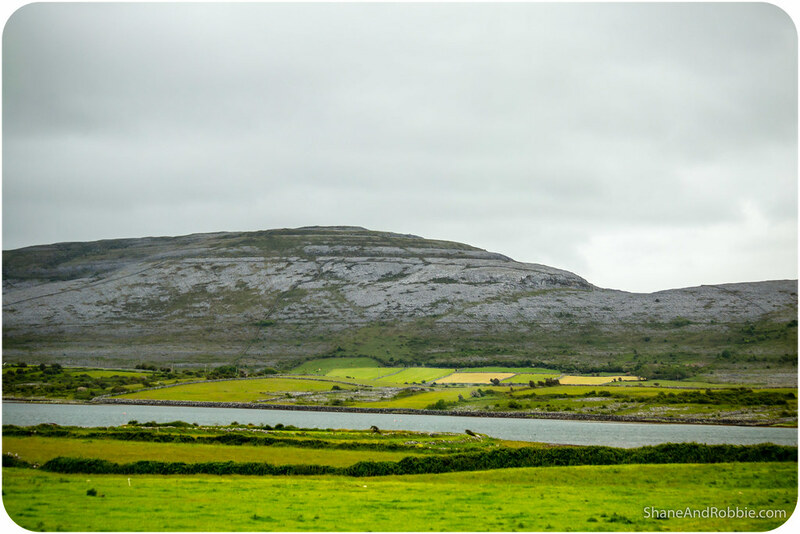 The views along the long road back were no less fascinating than on the way there, with the characteristic rocky slopes of The Burren gradually giving way to lush green fields as we neared the city. Every now and then we’d pass some unmarked medieval ruin – just sitting in some farmer’s back yard. The history in this place is literally littered all over the place – it’s so cool! 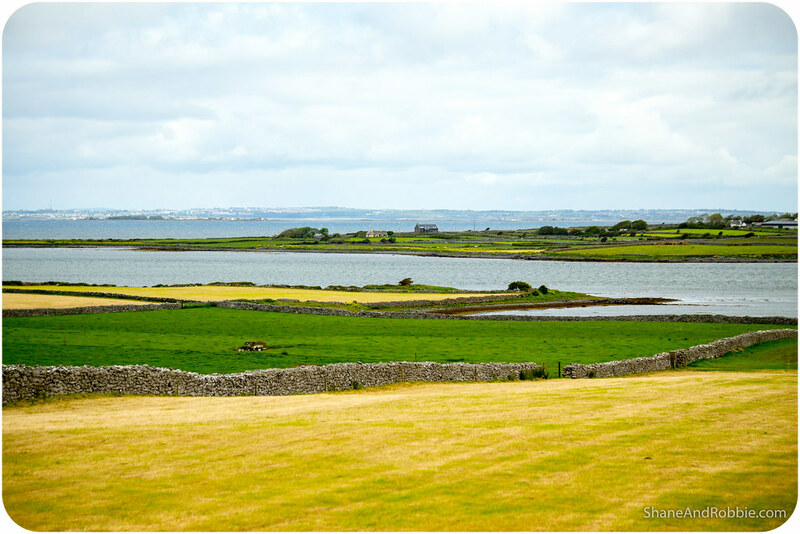 As we got close to Galway City the road began following curve of Galway Bay. Here we stopped one final time for the day at Dunguaire Castle. 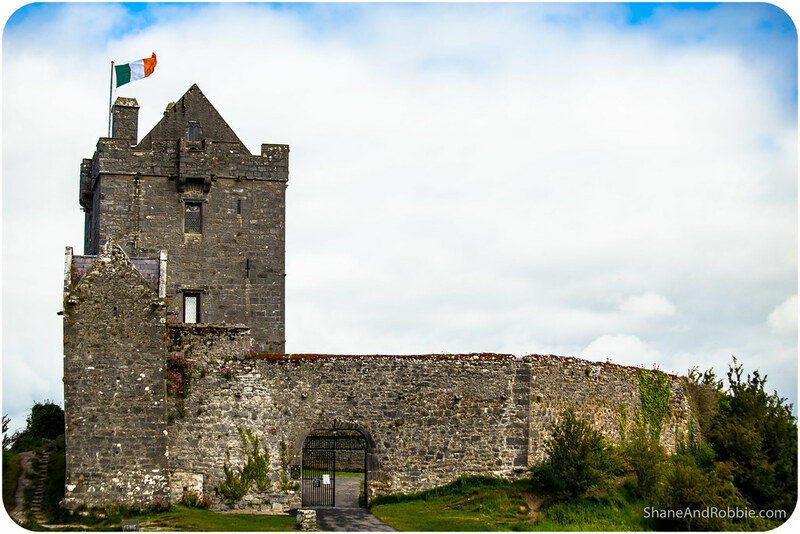 This 16th century fortress on the southeastern shore of Galway Bay once belonged King Guaire, the legendary king of Connacht. Today it’s a tourist attraction by day and a medieval banquet hall (i.e. restaurant) by night. Sounds like a terribly kitsch use of a beautiful old building! But then again if the hordes of feasting visitors, paying for the medival banquets, are helping to fund renovations and thus keeping the building alive, that’s not all bad. Finally, around 6:30pm, we pulled back into Galway City. Two hot showers and a simple meal later we’re back at the guesthouse, reflecting on the awesome day we had. 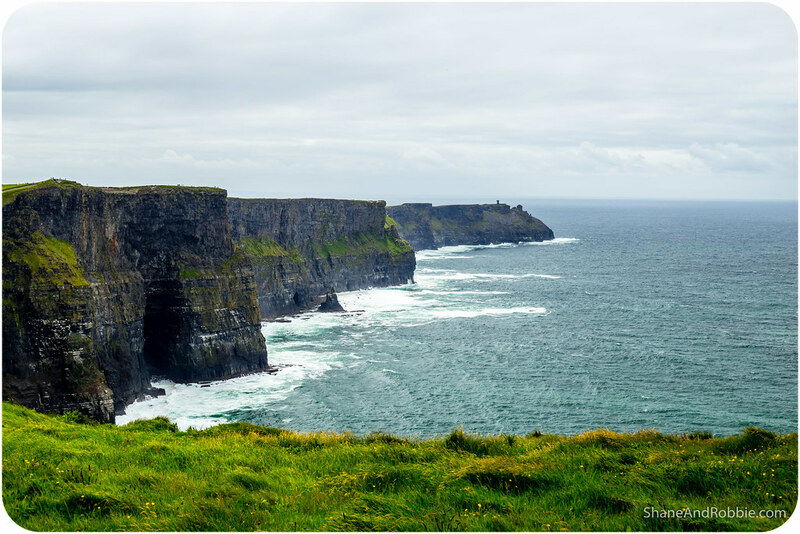 Equal parts mesmerising and terrifying, the Cliffs of Moher and The Burren are definitely one of Ireland’s highlights.